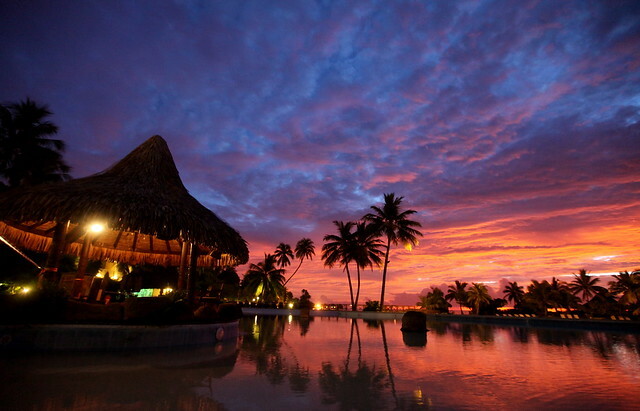 The island of Tahiti is nestled deep in the South Pacific among the 118 islands and atolls of French Polynesia. The island of Tahiti is actually a pair of volcanic mountain ranges and islands, Tahiti Iti and Tahiti Nui, connected by the isthmus of Taravao. Most travelers arrive in Pape’ete, the capital of French Polynesia and a city renowned for its excellent restaurants and nightlife. Tahiti is not your typical beach destination. While you can find a few white sand beaches along the coast, most of Tahitian beaches are covered with black sand. However, the beaches are no less relaxing than the white sands of Bora Bora or elsewhere. Because many travelers are seeking out the typical experience for their beach vacation, the beaches of Tahiti are quieter and less touristy than most. In Tahiti, you can walk along the black sand and listen to nothing but the cadence of your breath under the rolling waves. The adventure traveler will enjoy Tahiti’s dense tropical rainforest studded with mountains and packed with caves and waterfalls as well as the opportunities for exploring the South Pacific Ocean. Travelers can take independent or guided hikes in the mountains to see Tahiti’s stunning waterfalls, take surfing lessons, go caving, or SCUBA dive to see meet the exotic species of fish and coral under the surface. Located in the Society Islands, Tahiti is the perfect place to start before heading to some of the other islands of French Polynesia like Mo’orea and Bora Bora. Food is a major part of any culture, but in Tahiti the varied influences of the islands comes forth proudly in their cooking. Here you’ll find traditional Tahitian cuisine mixed with strong influences from Polynesia, China, and France. French is the official language of French Polynesia as France colonized the islands in 1880. Throughout Tahiti, but especially in Pape’ete, you will find excellent French bakeries specializing in such delights as crunchy on the outside and chewy on the inside baguettes, light and buttery croissants, and macarons by the dozen. Tahiti is also renowned for its seafood dishes, particularly poisson cru, raw fish served in a rich coconut milk sauce. Wherever you are in Tahiti, seafood dishes are not far away, and are prepared in a variety of styles. Tropical fruits are also abundant in Tahiti ranging from the standard banana to breadfruit to noni. Whether you prefer communing with nature while relaxing on the beach, diving deep into the ocean, climbing through the mountains, or something a little more adventurous, Tahiti has an experience for you. From Tahiti’s legendary black sand beaches you can swim, surf, or catch a boat further out into the ocean. Several companies offer boat tours, SCUBA and snorkeling excursions, fishing trips, sailing, and windsurfing classes. Inland, the rainforest beckons. Hire a guide to lead you through the dark, damp caves of Tahiti; trek just inside a few caves or get ready to swim through little nooks and large vaults for the most spectacular cave views on the island. If you’d prefer to stay above ground, consider bird watching for a leisurely morning, a strenuous trek through the mountains, or short excursions to see some of Tahiti’s many waterfalls.